Well, I did it. I caved and bought Fresh Sugar Lip Treatment SPF 15. I resisted this purchase for quite some time, as I honestly thought spending over $20 for a lip balm was absolutely insane and unnecessary. And in these trying economic times, it seemed less than prudent to purchase such an indulgence. But you know what? This might just be one of the best purchases I've ever made. For starters, the lip balm smells unbelievable. It somehow has the essences of sugar, lemon and vanilla all wrapped up into one very homey and delightful scent. Every time I unscrew the cap and twist up the balm, I just get excited and nostalgic at a mere whiff of this aroma. But the real beauty is in how it makes my lips feel. Vitamins A, C and E meld with moisturizing black currant oil and antioxidant grapeseed derivatives, leaving my pout feeling so soft and smooth it literally feels like two very tiny pillows. I have yet to see any dry and flaky skin on my lips or any redness and chapping around the lip area in general ... which is quite new and different in these cold winter months! Plus, it's got SPF 15, so every time I slick it on I feel better knowing I'm protecting my pucker against harmful UV rays. And I love how long it lasts. A few swipes back and forth and I'm good to go for at least two hours. It even lasts through my morning Diet Coke, my entire workout on the elliptical and an afternoon nap! What more could you ask for, right? 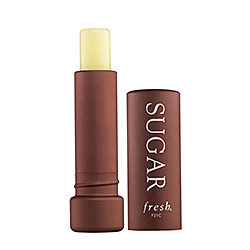 Fresh Sugar Lip Treatment SPF 15 retails for $22.50 at sephora.com. I love when pricey products turn out to be money well spent! And if this one survives an elliptical workout, I'm sold!